Slots Capital and Desert Nights are the most popular online casinos with games from Rival. To express their gratitude to loyal players all over the world you can get up to $2150 in special American Thanksgiving casino bonuses. We all have a lot to be thankful for at this time of year, that's for sure. I think it's nice of the casinos to give us one more thing to add to our list! “One thing I’m always very thankful for is all the loyal players that have been with us as we’ve grown and improved over the years,” said Slots Capital Host, Stephen Vaughn. The Gobblers Gold slot from Rival Gaming is most popular Thanksgiving game. Players that redeem all three bonuses then get $100 free. The redeem code for this final no deposit bonus is HAPPYTURKEY100. 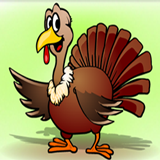 American Thanksgiving casino bonuses are available November 21 – 30 only. Details are available at Slots Capital and Desert Nights. This time of year the Gobblers Gold slot game is popular in Rival-powered online casinos like Desert Nights and Slots Capital. In the Pilgrim-themed game featuring early American settlers and their Thanksgiving turkey, scatters can trigger up to 100 free spins with 3X payouts. Their newest real-money online slot from Rival Gaming is 10X Wins, a classic 3-line, 3-reel slot with a Wild symbol that multiplies payouts by ten. It was added to the download, instant play, and mobile casinos for smartphones and tablets last month.